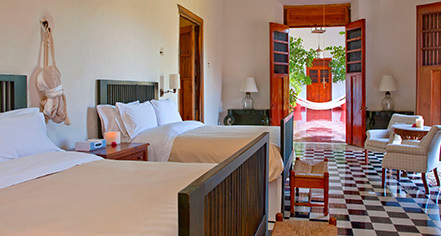 The former living quarters of the sisal hacienda’s managers were converted into cozy and delightful guestrooms at Hacienda Temozon, A Luxury Collection Hotel. 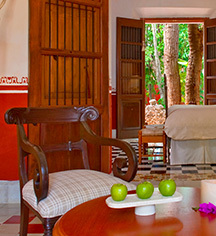 Guestrooms feature 7m / 23 ft high wood-beamed ceilings and all are the same width – the width needed for a hammock, the typical bedding of the time. Today, guests can still enjoy lounging in hammocks but guestrooms also feature large brass beds with Egyptian cotton linens and goose feather pillows for a restful night sleep.